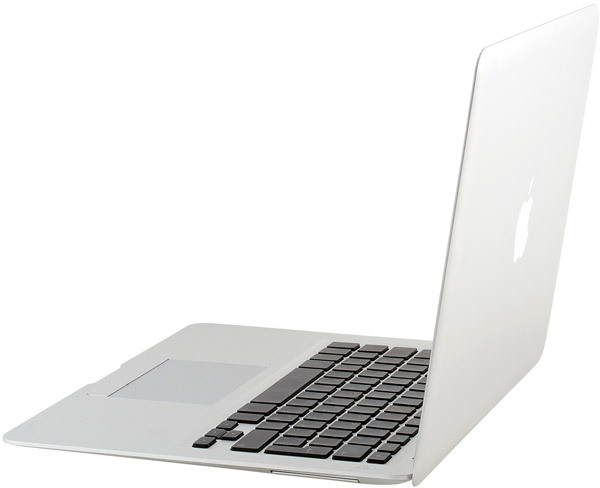 Prior to MacBook Air, the lines of Apple notebooks comprised two products (with different specifications) - MacBook and MacBook Pro. MacBook is a budget (in Apple's terms) compact notebook with a 13" display, black and white design, for home users, students, and people who don't need high performance (for example, for video processing) or a large display. MacBook Pro is designed for professionals (video and photo processing), it's bigger and heavier, 15" or 17" display depending on its configuration. On the whole, these two lines supplemented each other well, but they did not cover one segment. Many users wanted an ultracompact notebook from Apple, to be used in a plane or an office. MacBook Pro won't do because of its dimensions, and MacBook is too heavy and thick, and it's not good enough for a director or a top manager, as it's a budget product. The cost and functionality of a notebook do not play an important role for such people, they want a high image, ultracompact dimensions, and a long battery life, if possible. Apple MacBook Air is designed to fill this segment. This notebook was presented by Steve Jobs, Apple CEO, on January 15 in San Francisco. And it appeared in US stores already on January 30. We'll start the ball rolling with its design and then proceed to its technical properties and other features. The first thing that arrests attention is its slim design. This is a marketing feature of this product. Unlike MacBook and MacBook Pro, thickness of MacBook Air varies - it's minimal in the touchpad area and grows towards the rear. So it looks ultra slim from all sides, especially from the side of a user. By the way, Apple even filed to trademark Thinnovation: this word is actively used by Apple in advertising. Many people wanted Apple to roll out a sub notebook. However, MacBook Air offers a very good full-size keyboard and a 13.3" display, so it's a very comfortable notebook for work, no compromises. 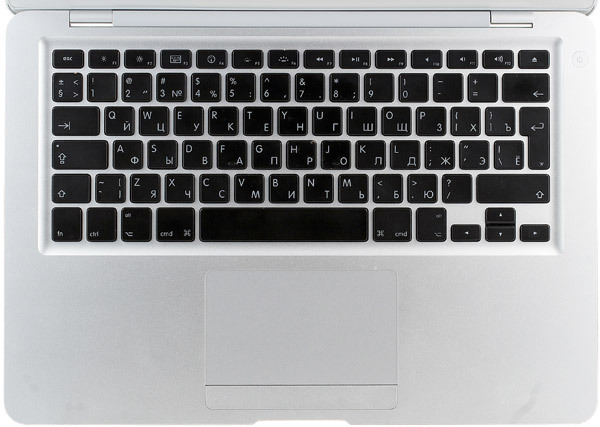 As you open the notebook, you will see a black recessed keyboard with each key in its own hole. 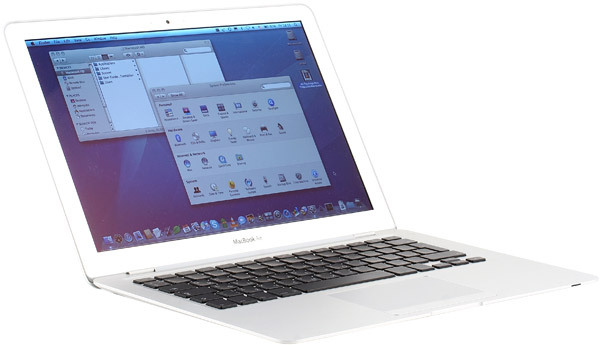 The same approach is used in MacBook and iMac (both wired and wireless). It's a convenient ergonomic keyboard. The keyboard has an important feature - bright backlight. It can be adjusted manually or automatically (using readings of the light sensor). The notebook has a big touchpad, much bigger than the one in MacBook and MacBook Pro. But the button is a tad smaller. Big size is convenient in itself. 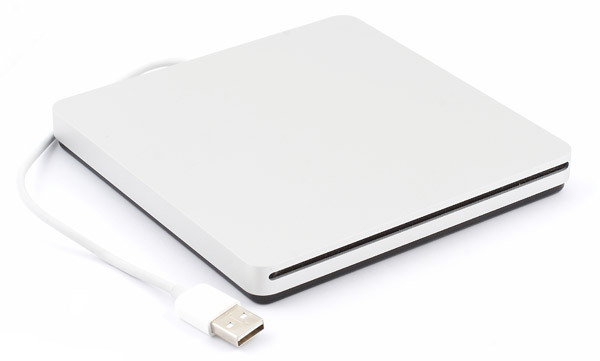 Besides, the touchpad supports multitouch technology. Along with two-finger scrolling, which appeared in Apple notebooks long ago, a number of new gestures have been added - zoom in/out images or fonts (for example, in Safari) by bringing fingers together or out (like in iPhone), change image orientation, switch to the next item, etc. The power button is in the upper right corner. There is an iSight camera above the display, light sensor (left), and a microphone (right). And where are the ports? They are easy to miss at first sight. The ports are on the right flank near the Power button. You can open them like a glove compartment in a car. The idea to hide ports in this way is dictated by compact dimensions of the notebook and its sleek design. The ports themselves can disappoint some users, who are used to plug many peripheral devices - there is only one USB port near the video-out and headphones-out. Where is an optical drive? In a store. It's not integrated into the notebook for the sake of ultra compactness. That's another aspect that can scare away a certain number of users, who like watching DVD in a trip and working with discs. How can you install an operating system and necessary software then? There are two ways out. Firstly, Apple offers an external USB SuperDrive for a democratic price (it's designed for MacBook Air - iMac fails to detect it). Secondly, Remote Disk, which allows to use a drive on your Mac or PC via Wi-Fi. Let's examine the bottom part of the notebook. We can see four black feet, which do not let the notebook slip and get scratched on a table, the above mentioned "glove compartment" with ports, and a grid for coolers, which also covers a speaker (note, there is only one speaker on the right, so you will get stereo audio only in headphones. That's another drawback for avid movie watchers and people, who like to work to music without headphones). A battery compartment is inside. Users are not supposed to replace the battery on their own, this procedure is not as easy as in MacBook and MacBook Pro. So you won't be able to replace a discharged battery when you are traveling (if you don't want to mess with a screwdriver, that is). This is also dictated by compact dimensions - if users could have replaced batteries on their own, Apple would have had to add convenient and reliable latches, which would have inevitably made the notebook bigger. However, if you travel with a backup battery, you will most likely prefer MacBook or MacBook Pro, because compact dimensions of MacBook Air won't be that important. The left flank houses a power connector with the MagSafe technology, which protects the notebook from falling down - if you trip on the power cord, it will just latch out.